NES Super Mario Bros. (JPN/USA PRG0) "warps, walkathon" in 06:55.18 by Bisqwit. This is a 7 seconds improvement to the previous walkathon movie that was submitted (and published) on April 1st, 2005; submitted at April 1st, 2008. 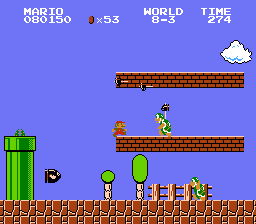 Among improvements are a commentary from the actors of the movie and some glitch applications not seen before in SMB TASes. Note that a 20-frame (0.3 seconds) improvement to this movie is known to be possible, but this version was chosen because it is more entertaining to watch. The faster version can be downloaded here.